The northern Ontario town of Attawapiskat has been in the public eye a lot over the last few years, because of its housing crisis. Victoria Lean’s documentary film, After the Last River, provides a much deeper look at the situation than you’re likely to get on a nightly newscast. The stories that she tells would be interesting (and distressing) at any time, but they are particularly relevant now, as the federal election gets nearer. Lean visited Attawapiskat for the first time in 2008. She tagged along with her father, ecotoxicologist David Lean, who had been invited there by the Cree community to share his expertise. De Beers had just opened a diamond mine in the area and residents were worried that this would lead to an increase the already high mercury levels in the local fish that were part of their traditional diet. That’s exactly what did happen. An aerial view of the Attawapiskat River community. Among the things we learn in After the Last River: In the 1970s and 1980s, the federal government built homes with substandard materials, and that housing has deteriorated further since then. Many homes do not have running water; residents use buckets for toilets. Some homes are plagued with black mould. In 1979, 30,000 gallons of diesel leaked under the elementary school, which remained in use, despite bad smells and students complaining of headaches. The school finally closed in 2001, and the students were moved into portables, right next to the toxic site. They had to wait until 2014 for a new school. Relatively recent news clips from Parliament and the Ontario legislature show that both levels of government are adept at playing the old “it’s-not-my-department” game. It’s truly maddening to watch those clips, after seeing the terrible conditions that people are living in. Old news clips shot in the north show that little has changed in decades. 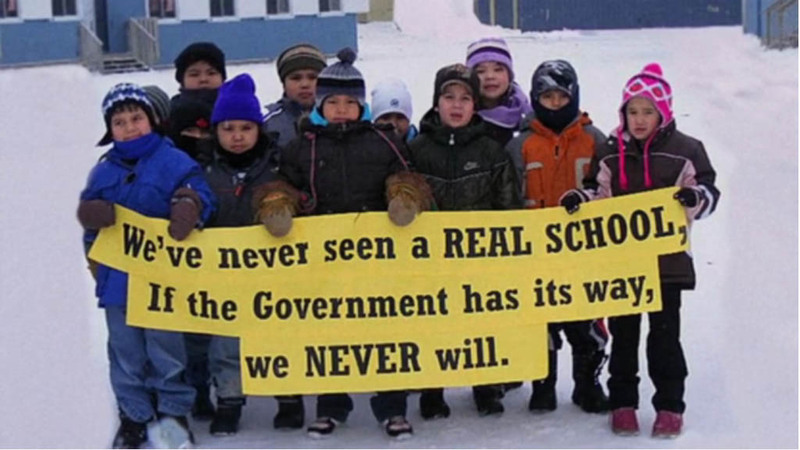 The mine has not improved the lives of the people of Attawapiskat. In fact, it looks like the mine has only brought benefits to DeBeers and its immediate employees. De Beers is said to have its eyes on 15 more diamond deposits in the area. Monday, Sept. 28, 2015, 7 p.m.
Director Victoria Lean, producer Jade Blair and special guests will be in attendance. The screening is co-presented with the Sustainability Action Fund and Mining Watch Canada. The venue is wheelchair accessible. For more information visit Cinema Politica’s Facebook page for this event.